I’ve taken thousands of calls from traders about computers. A lot of those callers ask the same questions about what should be “under the hood” in a good trading computer. 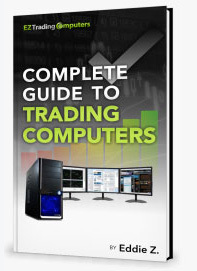 If you’re reading this, you probably already know about the guide I wrote to buying a trading computer. It covers most of those questions. But before you get specific about RAM and CPU speed and the rest of it, there are some basic principles that can help with buying a computer for trading. On the flip side, look at these principles as mistakes you should avoid. Avoiding these mistakes will save you thousands whether you’re building your own computer, shopping from your local big-box retailer, or buying from us. The three most common mistakes have to do with risks no trader should never take. It’s easy to overbuy when you purchase a computer without basing it on your true needs. Traders need speed, memory, and a middle-of-the-road graphics card. When you overbuy and overspend, you risk tying up valuable trading capital. Assess your trading computer needs first. What broker do you work with? What software do you use to trade? What markets do you trade? How many indicators do you run simultaneously? Typically, traders will overbuy on a computer by purchasing a gaming computer. Gaming computers come with expensive graphics cards that traders don’t need. Of course, you should have crystal clear charts on your screen, but you don’t need a high-speed graphics card designed for rendering 3D video. I started EZ Trading Computers because I felt traders were being overcharged. I firmly believe traders need to purchase a computer customized for the demands of trading. However, you don’t need to overbuy or get price-gouged. As a trader, you understand the idea of a stock being overbought. Basically, this means you bought too much, and the investment doesn’t justify the price. The same can be true of buying a trading computer. Money Saving Tip: Avoid overspending on fancy graphics cards. This could save you anywhere from $500 to $1000. No one wants to waste money. But sometimes we can be penny wise and pound foolish. When it comes to trading, this means buying the cheapest computer available. Don’t ever do this. Attempting to save 20% on a purchase can cost you more later. I’ve seen traders spend 3x more on computing equipment after under-buying. They’ve either ended up buying a second computer (with more power) pretty quickly, or had to replace a now-obsolete computer sooner than expected. Money Saving Tip: Your total cost of ownership goes up and the useful life of your computer goes down when you under-buy. It’s never easy to fork over the money to upgrade to a new computer. However, your computer is vital to your success as an individual trader. I recommend you add a replacement line item into your business budget. Plan to replace your main trading computer every five years (or so). Hear me out. I can hear your objections already. You probably think I’m saying this because I sell trading computers. Yes, it’s true, I own EZ Trading Computers. Yet, I don’t like replacing my own computer, either. Look at a new trading computer as an investment into avoiding the risk of down time, missed trades, and hours on the phone with tech support. Computers are appliances for business. They have a useful life, and they need to be replaced. You put your trading profits on the line when you deny this fact and just wait until there’s a problem. Think about it this way. Can you stash away $1.00 per day for 5 years? If so, you’ll have $1,825 (365 days*5 years) saved in your budget for your next computer. Don’t wait till you’re experiencing a total meltdown to consider purchasing an upgraded trading computer. Plan ahead. Money Saving Tip: Compare saving $1/day to the money lost on bad trades, slippage, security risks from viruses, and down time from repeated technical fixes. There’s no comparison. You’ll save thousands. The key to saving thousands on computer equipment is buying the right configuration and keeping it up-to-date. If you’re unsure what configuration is right for you, please contact us. We’re here to help.